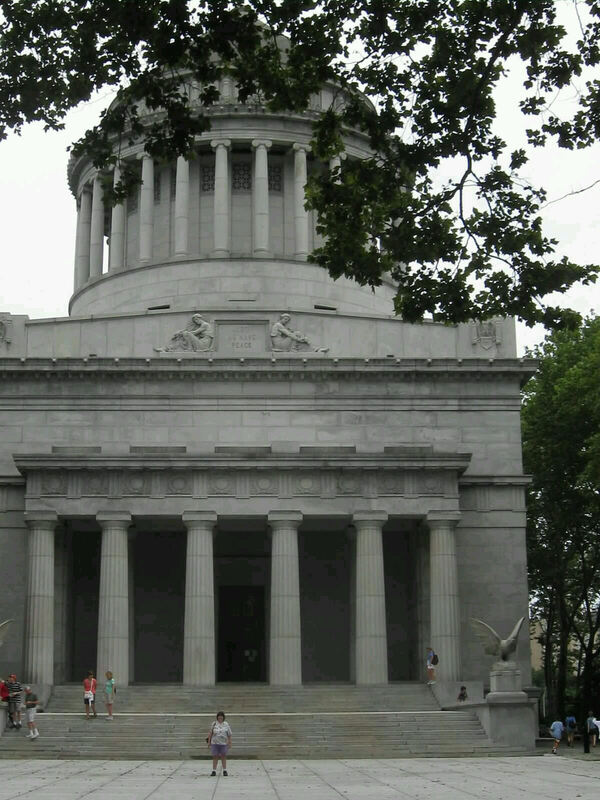 Our 2011 Road Trip #15: Grant’s Tomb Raider « Midlife Crisis Crossover! Literally the closest we’ve ever been to Harlem, which was a few blocks northeast of here. There’s that wife of mine, once again on her quest to catch ALL the dead Presidents. It would require our longest subway ride of the week, but a special treat was waiting for us at the end of the line. 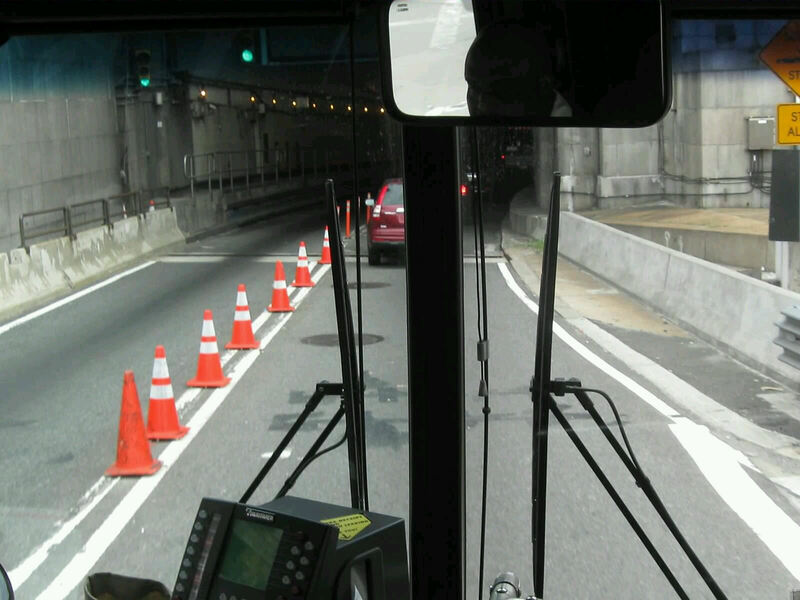 Same sight every morning: our descent from Weehawken into the Lincoln Tunnel. DAY FIVE — Wednesday, July 13, 2011. The interminable Wednesday bus wait in front of the hotel was probably a more accurate representation of New York rush hour than the previous mornings had been. We stood and watched while three #159 buses and one #156 bus passed the Lincoln Harbor stop before a #158 finally arrived, per our prepaid passes. 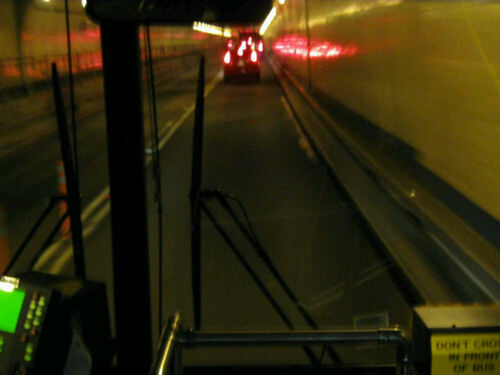 Inside same tunnel. Ooh, ahh, spooky. We’d seen it daily since arrival, but Day Five was the first time I’d been awake enough to snap pics of it. First thing across the river, I checked an item off my NYC bucket list and fetched myself a fresh breakfast sandwich from an authentic mom-‘n’-pop food stand, where I was introduced to the obligatory question, “Salt, pepper, ketchup?” No Indiana restaurateur ever says this, especially not during breakfast hours. Pepper shakers here can last for years on a single filling. I was easily hypnotized. It was DIFFERENT. My quickly assembled sausage-egg-cheese sandwich was basic but enjoyable, especially with salt and pepper. I don’t get the idea of ketchup with eggs. We grabbed my son a smoothie from a different stand, but Anne was pretty sure a full breakfast was still needed. I kept encouraging the two of them to find whatever they wanted. My son’s hatred of breakfast food complicated matters as usual. For lack of patience for the thrill of the hunt, we wound up at the Times Square Hard Rock Cafe, which sells an offensively overpriced breakfast buffet smaller than we’ve had at some three-diamond hotels. We have our own Hard Rock Cafe in downtown Indy, so this place was hardly attractive to us on its own novelty merits. When I used the bathroom, I tried not to look too obvious as I glanced over at the clipboard of the health inspector who was in there doing his job at the same time. Far as I could tell, no major offenses had been discovered yet. 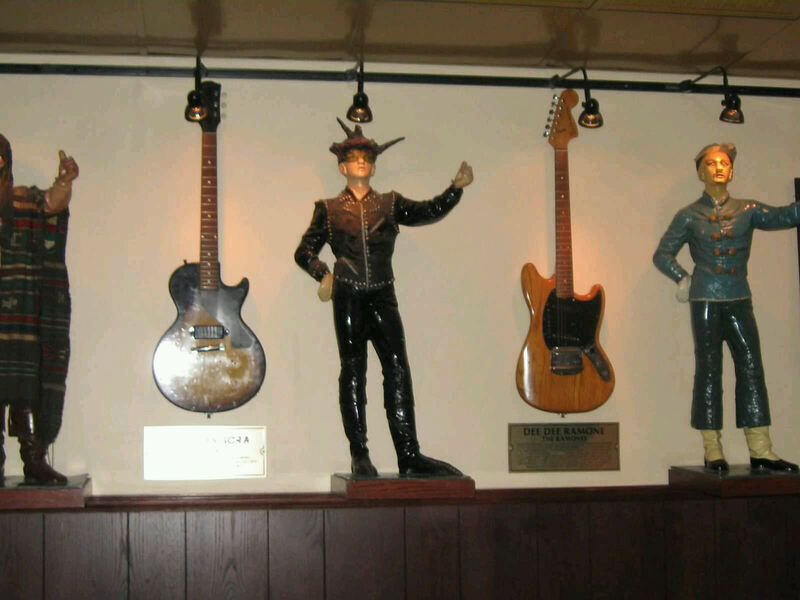 The guitars of Richie Sambora and Dee Dee Ramone. 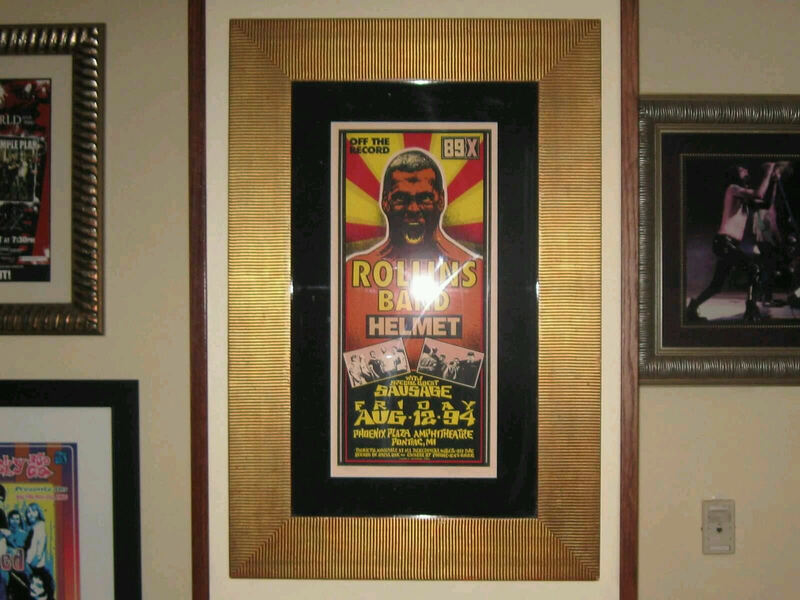 Tour poster for the Rollins Band circa 1994’s Weight. 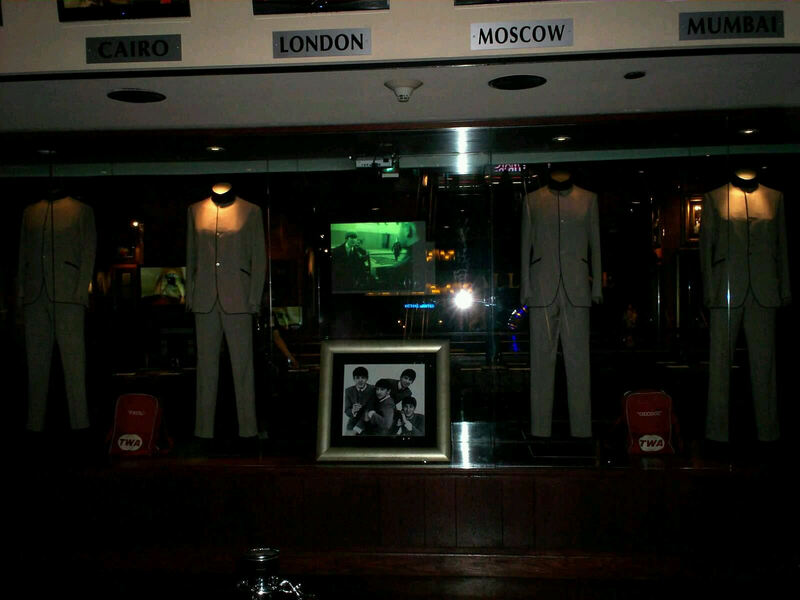 For you popular-music lovers, have some Beatles suits. 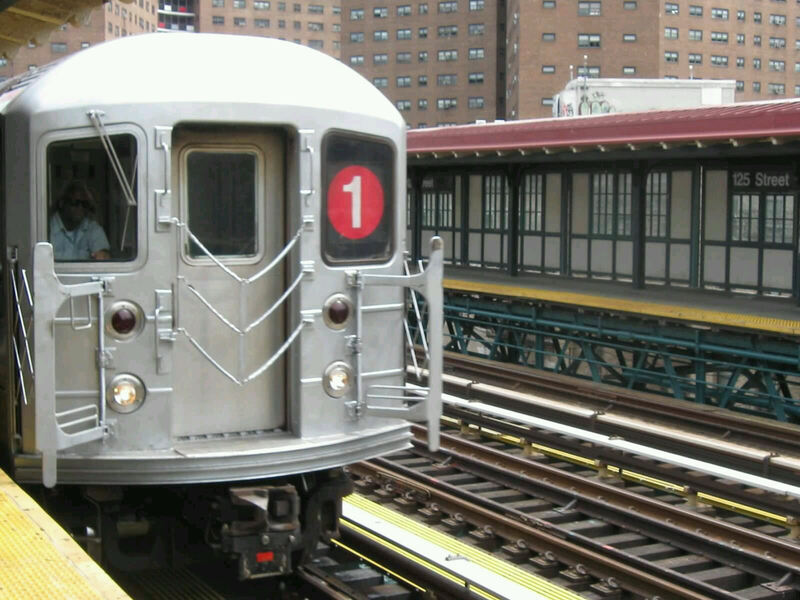 From Times Square we took the #1 train north to 125th Street, just a few stops shy of Harlem. This ride was notable for being our very first encounter with a genuine New York homeless guy waiting until after takeoff to announce his wishes and walk the length of the car in hopes of cash rewards. 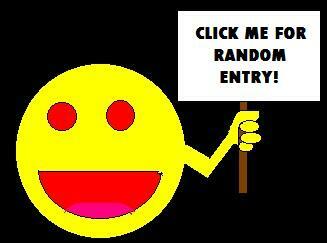 Judging by TV and movies they’re ten thousand strong, but his was the only locked-car proposition of our week. 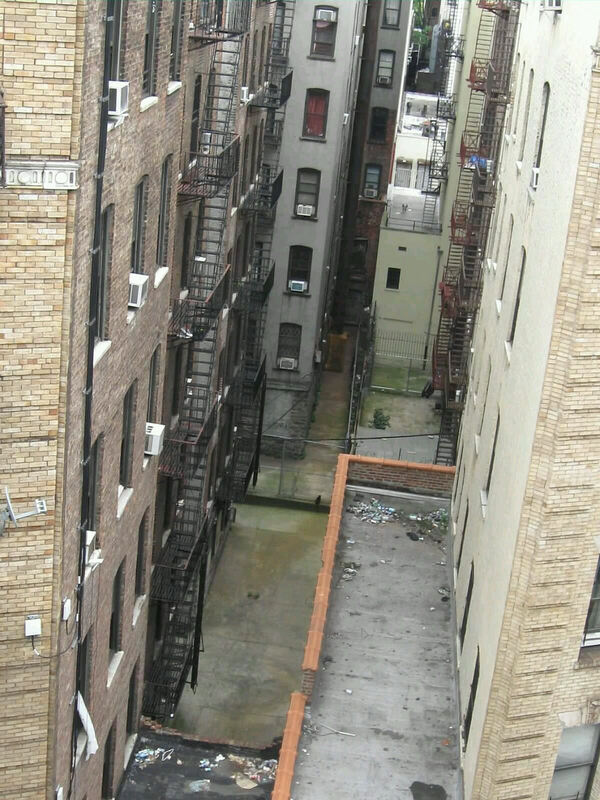 This sample tenement alley along the way near Riverside Park was far from threatening, though the further north we traveled, the denser the graffiti grew. Perhaps it’s unfair to draw a generalized correlation between graffiti density and crime rate, but I doubt their relationship is inversely proportional. Imagine any number of Marvel heroes swinging, bouncing, or doing parkour through here. The all-uphill walk south from the 125th Street station to 122nd Street brought us to our first real attraction of the day, famous Grant’s Tomb. 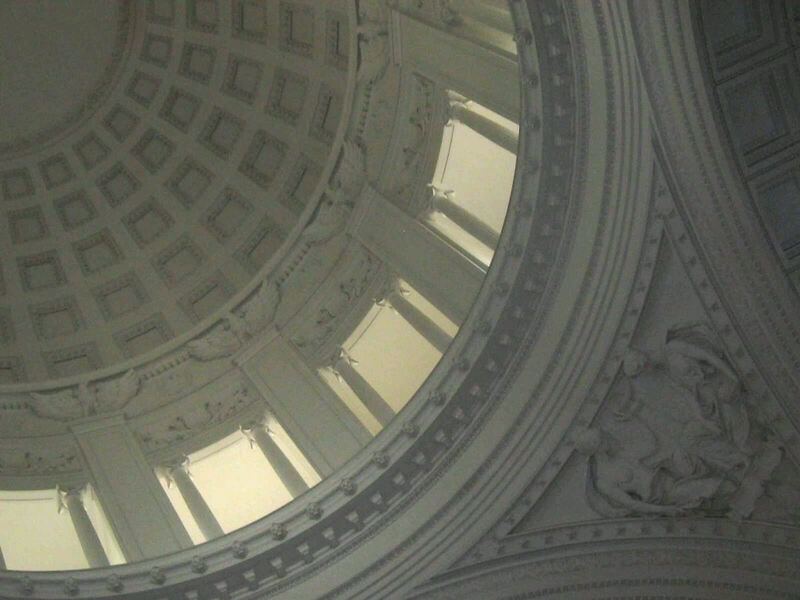 This gigantic domed building — subject to many a joke about “Who’s buried in Grant’s Tomb?” among earlier American generations before ours — houses a few busts, several 19th-century flags, thousands of square feet of empty space, and exactly two items of major note. 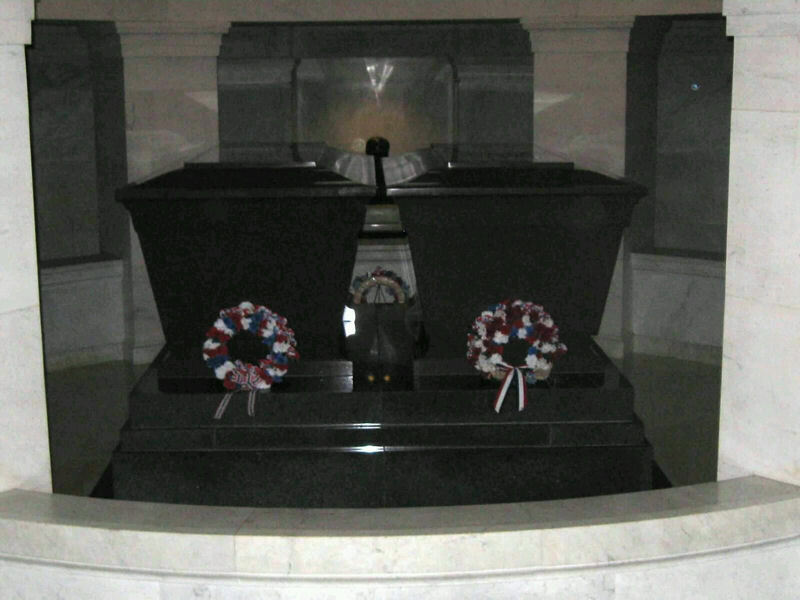 As it turns out, “Who’s buried in Grant’s Tomb?” really is a trick question. 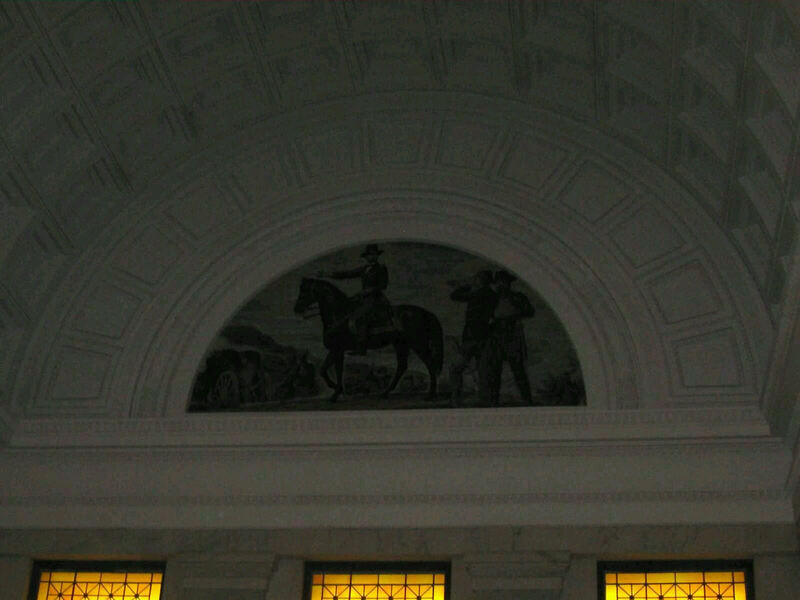 The late President Ulysses S. Grant and First Lady Julia Grant are entombed above ground, not actually buried. 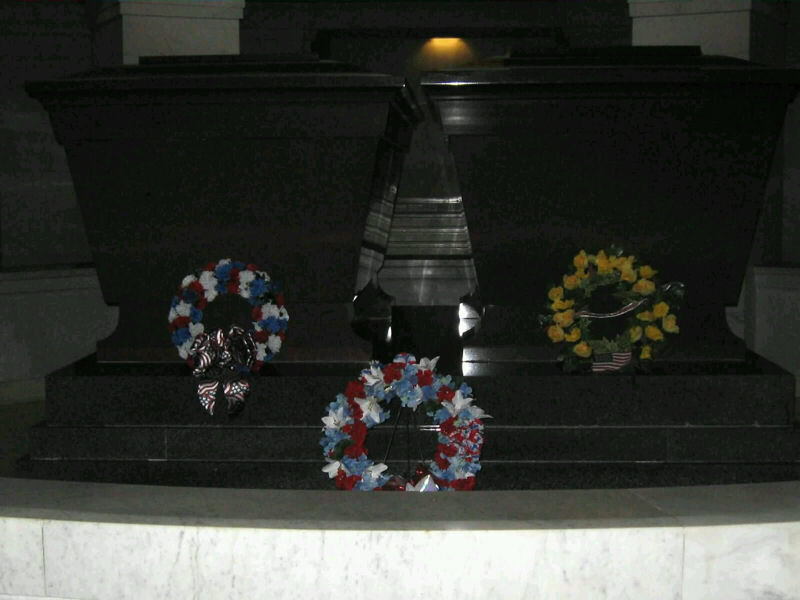 No Presidential burial site should ever want for wreaths. View from the other side. Hiding in the shadows, a bust of trusty sidekick General William Tecumseh Sherman stands guard from the rear. The fun part of this stop was my son’s surprised look when we explained to him that former President Grant was also the same General Grant who spearheaded the North’s final victory over thousands of Confederate flag lovers. Somehow he’d never made the connection. Us: 1; his school: 0. Cross-section of Grant’s Dome, a significant architectural deviation from the rest of the ‘hood. Scenes from Grant’s life, presumably. Anne has read his autobiography and could surely describe what’s going on here. My guess this was that one time he discovered a new state. 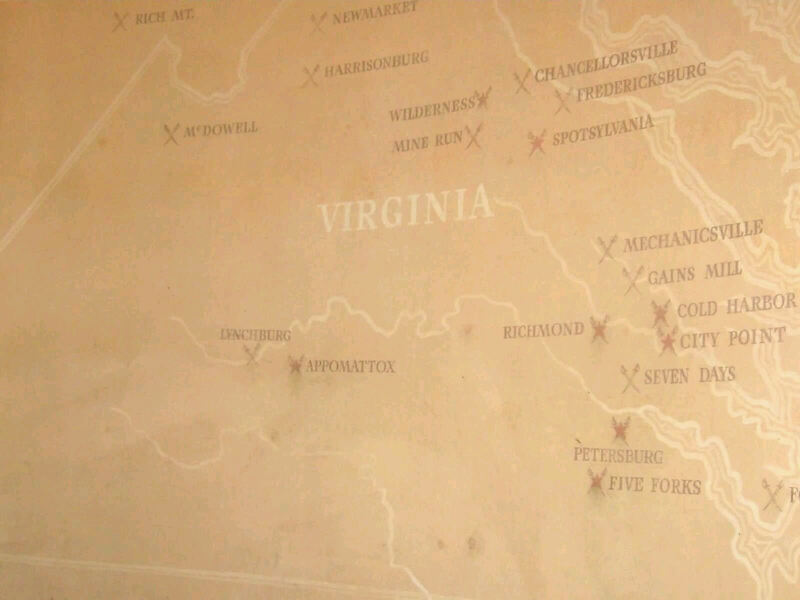 A map of important Civil War sites, handy for planning your next history-fan vacation. 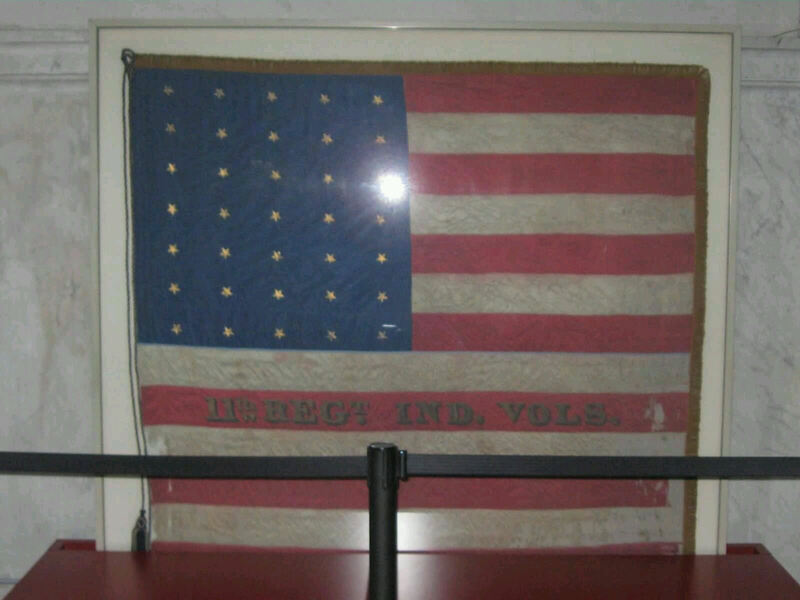 Of the extensive Civil War battle flag collection on hand, we noted only the one belonging to the 11th Indiana Infantry Regiment because in rare moments we get all nativist like that. The only rain of the entire week — a notch above a drizzle, at that — helped cool us off during the walk back to the 125th Street station, where the #1 train arrived to take us back south. 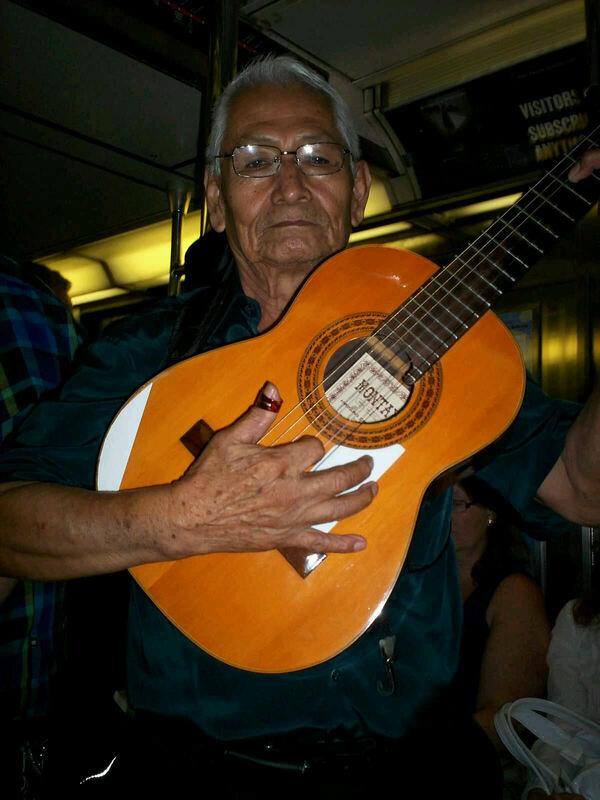 Our entertainment for this ride was this elderly mariachi, whose haunting all-Spanish vocals belied rather peppy strumming skills. Anne was all too happy to tip him for his performance, this time with my blessing. See, that is how you entertain for subway income. Photo #2 in Anne’s “People of New York” miniseries.